Our 1860’s commercial building on the square needs some tinkering on the roof. Mostly I just need to get up there and fix a few issues, then do some annual maintenance. We don’t have a hatch to get on the roof (previous owners removed it and used neighboring buildings…for a variety of reasons not an option). So, I need to make one. Figured I’d take that opportunity to repair an issue that is causing a leak and a structural concern. 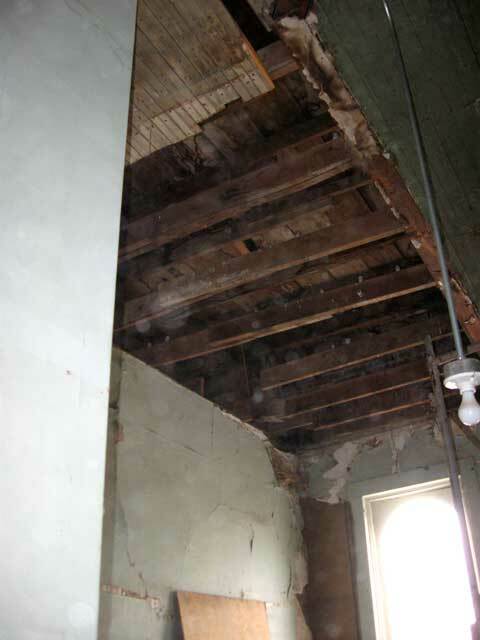 Namely, somebody moved a wall near a 100 years ago and left several roof beams unsupported. This caused a sag in the beams and in the roof surface (and a leak in the sagged area). 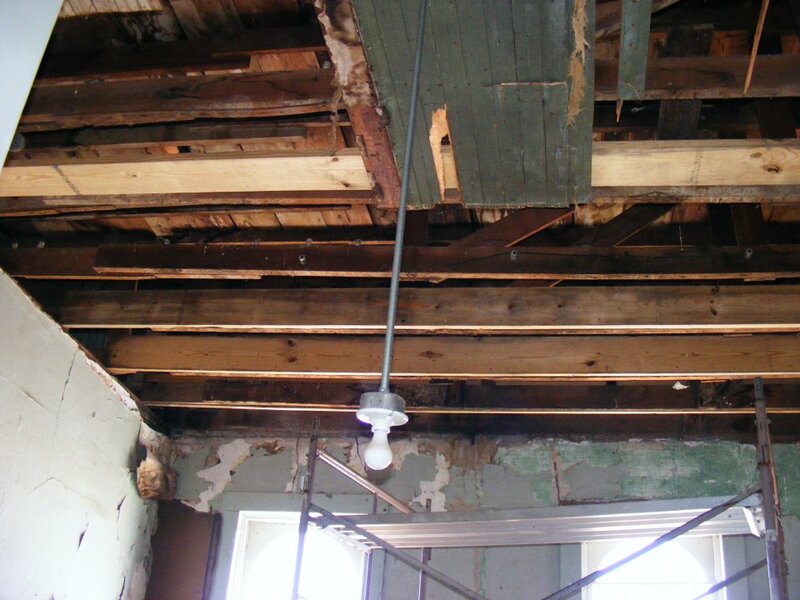 They had sagged well over 5 inches and popped much of the beadboard off that ceiling. We removed the rest. I then spanned the room with 2″x12″x16′ beams across the first three (closest to the window) unsupported beams. Once I had those in place, I wrapped them with great big honkin’ web ratchet straps and use a combination of excessive force from the straps and excessive force from sledge hammering the beams to take the sag out and get everything lined back up. It went VERY well. I got the first three in place (closest to the windows) and was able to remove the sag from the roof. The sheer work involved here simply doesn’t show in the pictures. A LOT of force and time was required to straighten everything out. I should mention the several hundred pounds of pigeon crap in the attic, which is another reason to remove the beadboard. Much thanks to my friend Mike for helping! This entry was posted in Carpentry/Structure, On the Square. Bookmark the permalink.